What is the name of the second tug and what were they working on? A photograph of the tugboat RESCUE, a second tug and a barge anchored in a bay or river. There were three late nineteenth century tugs named RESCUE. This one has ownership markings on the bow that appear to reference "Deseronto". 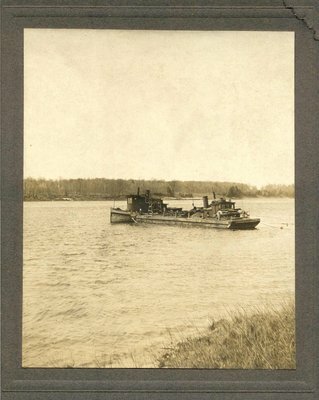 A 62 foot tug was built in Deseronto in 1885 for the Deseronto Navigation Company (in turn controlled by the great lumbering interests of the Rathbun Company which effectively owned the community of Deseronto). The company acquired a fleet of tugs in the 1880s, a number of which might be the second vessel. They were particularly active on the Bay of Quinte which might be the body of water here.